Nowadays, people are investing a lot in their property as it adds extra value and can dramatically increase the resale price. Keep the lawn area to a minimum as you will have to deal with wild plants and weeds. Focus more on pathways and flower beds planted with low maintenance perennial flowers. Also, make sure that the borders of the deep planting beds are wide to add a little style to it. Trees always add a unique look to your big backyard. To give the full effect, you will need to wait for the trees to grow a perfect size, which is 8’ tall and 1-2” in diameter. Bushes cut in various designs add to the overall look of your garden. So, plant a few bushes in a row and invest in a good gardener that will help to maintain them properly. Adding ponds, fountains and waterfalls is always a great way to make your backyard look fancy and it also adds to the value of your home. Rainbow Gardening can do the installation for you; the serene noise of the water flowing blocks unnecessary noise pollution. All fancy gardens have one common feature and that is garden lighting. Whether you install a LED pathway, string lights, a strip of LED lights on the baseline of your stairs or all three of them, it will make your garden look elegant and fancy. Adding the colourful ceramic pots to your garden will definitely add some character to your garden. 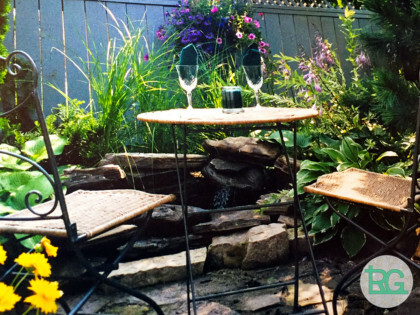 It will also help you in setting up a theme for your backyard. Try going with a rustic theme to add that extra touch. Spiral pathways add a little fancy touch to your plain pathways. They will set a serene and a peaceful vibe to your outdoors with a different click to it. Wood and gravel are a good combination for it. If you are looking for gardening services in Toronto, Rainbow Gardening is your best bet when it comes to creating a fancy garden for you. Drop us a line … we will follow up right away.